I like a good calendar. That's why I often give calendars for Christmas gifts. There are two types of calendar I like so much that it just isn't the new year until I've posted one above my desk and one in the kitchen. The one above the desk is the Dilbert calendar. Having worked for so many years in massively dysfunctional organizations, I find the Dilbert humor still resonates (and probably always will). The calendar in the kitchen is the Kliban cat calendar (pictured at right.) I guess I like Kliban cats because all of them are classic tabbies—what my mom used to call "alley cats"—and because they are so entitled. 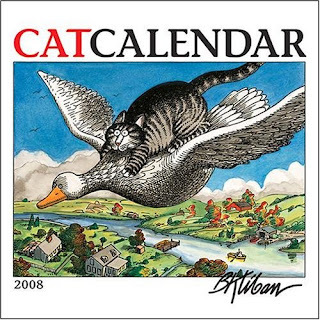 The Kliban cat on the cover of the calendar looks just like our Zoe—big, good-natured, and a bit goofy. Zoe has taken to vocalizing quite a bit recently; I'm wondering if it's because the neighbor's cat is a very accomplished meower who "sings" to get our attention, and Zoe is trying to compete.